Postcard AU-324800 from Australia shows Nội Bài International Airport (IATA airport code: HAN) in Hanoi, Vietnam. 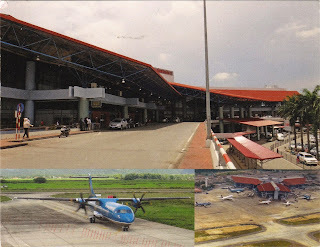 It is the second largest airport in the country, 45 km or 28 miles from the city center. The airport was opened on January 2, 1978. It has two concrete runways: 11R/29L (3,800 meters) and 11L/29R (3200 meters). In 2010, approximately 9.5 million passengers passed through the airport, which surpassed the designed capacity of the T1 terminal of 6 million passengers per year. The second terminal under construction will bring the capacity to 16 million passengers per year.